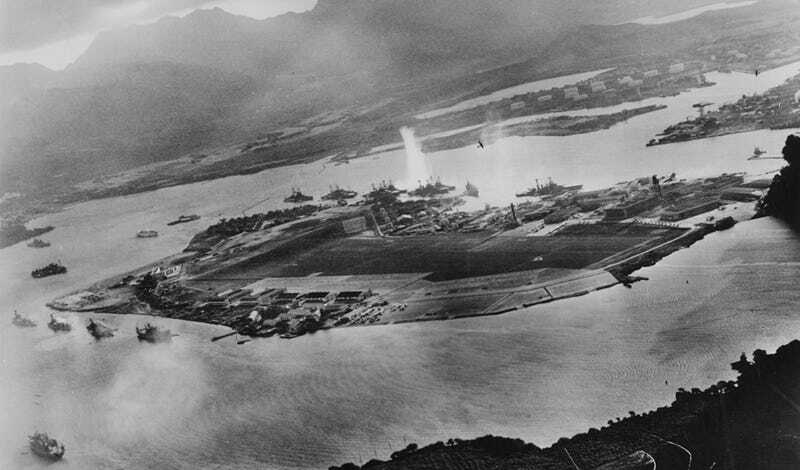 December 7, 1941 – Japan launches a sneak attack on US military bases at Pearl Harbor, Hawaii. When Commodore Matthew Perry arrived in Japan on July 8, 1853 (under orders to force the opening of Japanese ports to American trade, it should be noted), he found a closed society that was entirely self sufficient. However, following contact with the outside world, and the restoration of imperial rule, Japan quickly became an industrialized nation, and, as such, she increasingly needed more natural resources to keep her factories working. By the 1870s, Japan was already stretching its tentacles outward with eyes on resources they did not possess, such as coal, oil, steel, tin and rubber. In 1940, Japan’s stated goal became the creation of what they called the Greater East Asia Co-Prosperity Sphere, which was really nothing more than a grandiose name for a hoped-for Japanese empire that would encompass most of the western Pacific, a large part of eastern China, southeast Asia, and as far south as New Guinea. Essentially, their goals were identical to those of Germany, in that they wanted to create their own Lebensraum in the Pacific. In 1937, Japan invaded China, starting the Second Sino-Japanese War, but found itself bogged down by 1940. In order to continue their offensive, the Japanese would need to sever the supply lines coming into China from the South. This meant that the Philippines, Guam and Wake Island would have to be taken, as well as the British Imperial possessions of Malaya, Singapore and Hong Kong. But, to be successful in this operation, they would need to neutralize the American fleet in Hawaii. While many believe that the Japanese attack was entirely unprovoked, the US had actually provided Japan with a casus belli. Since 1939, America had been engaged in an economic war with Japan as a result of Japanese military actions in Indochina, and some believe that President Franklin Roosevelt was looking for an excuse to go to war in Europe, and Germany and Japan were allies at the time. However, the majority of America was mostly non-interventionist at that time. The Japanese attack on Pearl Harbor changed all that, and gave Roosevelt the justification he needed to take America into the Second World War. Some even suggest that Roosevelt had prior knowledge of the attack, but allowed it to happen anyway. On November 26, the Japanese fleet, which included the six aircraft carriers Akagi, Kaga, Sōryū, Hiryū, Shōkaku, and Zuikaku, stood out from northern Japan and steamed towards Hawaii. Arriving north of the islands on December 6, they prepared for the attack, completely undetected by the Americans. Early on the morning of December 7, 1941, two successive waves of Japanese Mitsubishi A6M fighters, Aichi D3A dive bombers and Nakajima B5N torpedo bombers launched from the carriers. The first wave of 180 aircraft approached Oahu from the northwest, where they were detected by American radar installations. However, the radar operators believed that they were seeing a formation of Boeing B-17 bombers that was scheduled to arrive that morning from California. The Japanese attackers found Pearl Harbor completely open to attack, with ships moored side by side and defensive emplacements unmanned. Commencing their attack at 7:48 am local time, the slower torpedo bombers led the way, since they would be most vulnerable once the Americans started shooting back. They headed straight for Battleship Row, while the dive bombers attacked ships and other targets in Oahu, including Hickam Field and Wheeler Army Airfield. The second wave, arriving at 8:54 am and made up of 171 aircraft, attacked simultaneously from three separate directions. Of the eight US battleships moored in Pearl Harbor, all were damaged and four were sunk. The attacks also sank or damaged three cruisers, three destroyers, an anti-aircraft training ship and a minelaying ship. The attacks on the airfields destroyed 188 aircraft, including four of the twelve B-17s that arrived from the US while the attack was underway. In all, 2,403 Americans were killed, over half perishing in the USS Arizona when a bomb penetrated her deck and detonated the forward magazine. Against the American casualties, the Japanese lost 55 airmen, along with nine crewmen from six midget submarines that also took part in the attack. A third wave, which could have done crippling damage to American oil and port facilities, was not carried out. The Japanese attack on Pearl Harbor and the island of Oahu ranks as one of the most audacious in military history. For the navies of the world, it demonstrated that the aircraft carrier, not the battleship, was now the most potent capital ship in the modern fleet. And though the attack was judged a tactical success, it ultimately turned out to be a serious strategic blunder for the Japanese. While the Japanese goal of keeping the Americans from interfering with their immediate plans in the Pacific was successful, the attack fell short of its aim of destroying the American Pacific fleet and putting the strategic harbor out of action. Key port facilities and oil installations were not destroyed, or were quickly repaired, meaning that Oahu never stopped functioning as a forward naval base as the Japanese hoped. Due to the shallow draft of the harbor, all the battleships but the Arizona were raised following the attack, and six of the ships were repaired and returned to fight later in the war. The loss of older battleships also hastened the modernization of the American fleet. But, most importantly, the three American aircraft carriers stationed in the Pacific—the USS Enterprise, USS Hornet, and USS Yorktown—were out to sea on December 7 and escaped the attack. Had they been sunk or seriously damaged, it would likely have set back American efforts in the Pacific for a year or more.